Powerful, Heavy Duty, Reliable and lots of Features make the Stanley J5C09 the go-to choice for protection against battery and tyre emergencies. The Stanley J5C09 jump starter is a best selling jump starter on Amazon, so what makes this jump starter better than the rest of the crop, and are there any downsides to this particular model? There are plenty of reasons to like this jump starter, but there are one or two negatives, read on and make an educated decision on your selection with our in-depth and detailed review of the Stanley J5C09 jump starter. 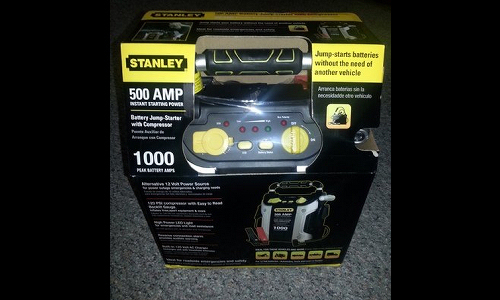 This is the big daddy of all Stanley jump starters, capable of handling even the most heavy duty of emergency situations, and is without doubt the best jump starter with air compressor built in. For more information on the manufacturer of this model see our Stanely info page. 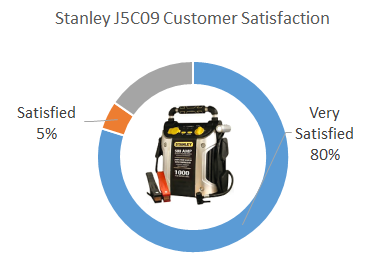 We’ve summarised every customer review published on the web into the following chart so you can see at a glance how the Stanley J5C09 is rated by actual verified owners. These reviews were collected from large online retailers and totalled over 1,000 individual reviews. 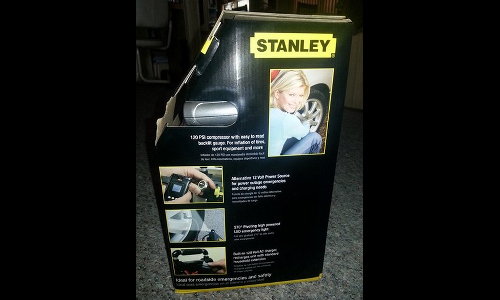 How the Stanley J5C09 improves your motoring experience. The purpose of this jump starter is no different from any other – it will jump start your dead vehicle without an external power source and without the need of another vehicle; just hook it up, power it on, and you will be good to go in seconds. These devices are popular therefore with anyone concerned about being stranded somewhere with a flat battery, and is applicable for cars, bikes, boats, industrial machinery, trucks, RVs etc. For everyday use, occasional use, or once-a-blue-moon emergency use, this jump starter is more than capable of bailing you out. It’s main unique feature being that it is a multi-functional device that will offer peace of mind for two common concerns for motorists – flat batteries and flat tyres. On the unfortunate occasion that you do get stranded due to any motoring emergency, this model does also have a bright LED light for safety. 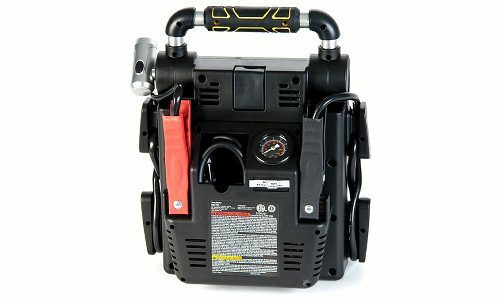 It is this sense of reliability and knowledge that even in the middle of the night, at any temperature and in any location you or a member of your family has this backup solution to a discharged battery that makes jump starters such a popular purchase for drivers, not just for themselves, but as a gift to family members. New drivers may wonder why their Dad just bought them a jump starter to lump around in their new car, but Dad’s got that piece of mind that his son or daughter will not get stranded when the battery in that second hand motor finally gives up the ghost. Anyway enough meandering, let’s get down to business and look at this particular model. These features together on one device make the Stanley J5C09 stand out amongst other popular jump starters, even the top selling Clore JNC660 does not have these handy features. More than one car to start? No problem with 1000 peak amps! This is very light considering it has an air compressor! Flat tyres? Not a problem, this compressor will pump up a flat tyre no problem. Tested and very accurate, pump with confidence! Pump up bike tyres, footballs, paddling pools, air beds etc. 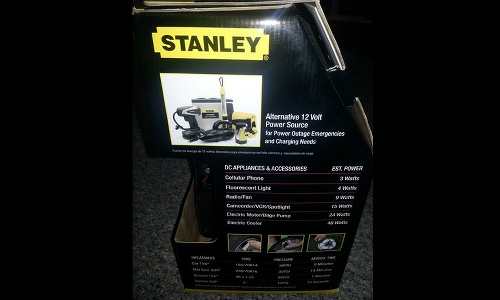 Probably the biggest reason for the success of the Stanley J5C09 is the multi functionality of the unit. 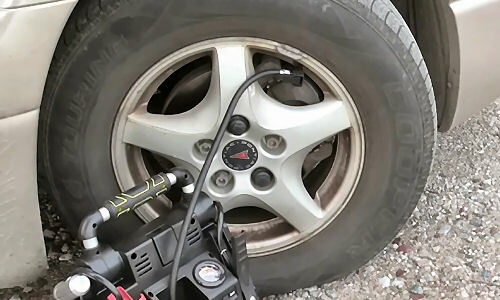 Not only is it more than competent at it’s core function of jump starting tired batteries, thanks to its compressor it will also easily re-inflate a tyre that’s losing pressure – even in the dark thanks to the built in light. Although we did mention the weight of the unit, it is actually no heavier than other units that deliver the same level of output.One of the biggest concerns for users is the risk of sparking, however Stanley have built in safety measures to prevent this from being an issue. Combine these features with a rugged build quality and you have a winning package that we highly recommend. Built in air compressor for those annoying tyre emergencies that strike at the worst possible time. At 18 pounds this is no light weight. However, as this is a great jump starter with a built in compressor you might expect it to be even heavier, so well done to the design team for keeping the weight down on this jump starter air compressor combination. If weight is a concern for you, check out the PowerAll Jump starter, as it is just as capable, but a fraction of the weight. Why don’t the LED indicators illuminate when I press the battery status button? Why can’t faulty units be returned? Give the unit an full initial charge upon purchase. 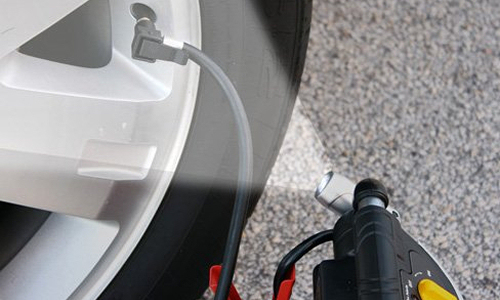 Charge the unit until the FULL indicator lights every 2 months. These units can be charged using the built in AC charging adapter. Simply connect a household extension cord into the AC charging adapter on the unit to begin charging. Unplug extension cord when green charging LED illuminates solid or flashes. 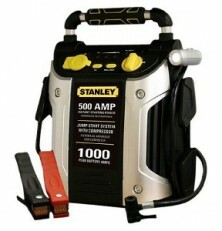 Note that some Stanley models require to be charged using jump starters with a small barrel pin connection. All of the Baccus Global (Stanley) jump starters have battery status indicators. Depending on the model, there may be 2 – 4 LED indicators. 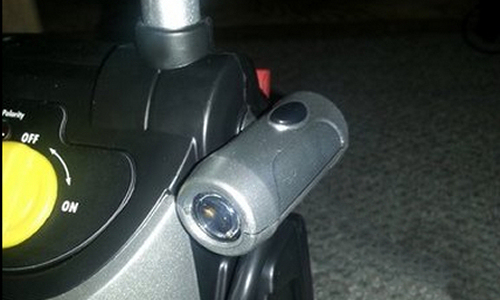 Once all of the LED indicators illuminate and the green LED lights or flashes, the unit is fully charged. These indicators are like a battery “fuel gauge” to show how much charge the internal battery currently has. 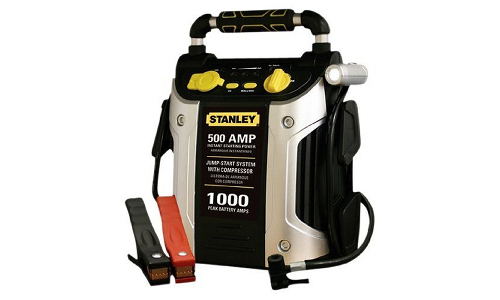 All Stanley (Baccus Global) jump starters are manufactured with reverse polarity alarms that give out an audible and visual alarm if the cables are connected incorrectly. HOWEVER it is important that the jump starter is ALWAYS connected while in the OFF state. Any jump starter that is connected incorrectly while switched on risks serious damage and would invalidate any warranty. As with any electrical device, read the instructions first. You can download the instruction PDF for the Stanley J5C09 below. Stanley J5C09 Instruction Manual PDF. 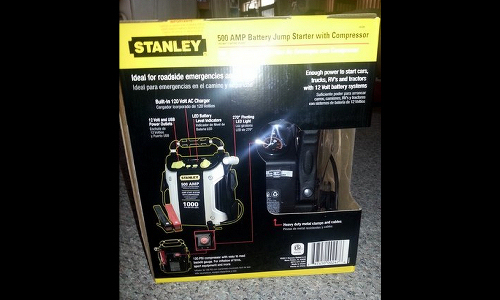 On stanley jump starters you should pressed and hold for several seconds for the battery status indicator to operate. Note that a jump starter that has not been regularly charged as described on this page may have fallen into a depleted state and will not display a charge. 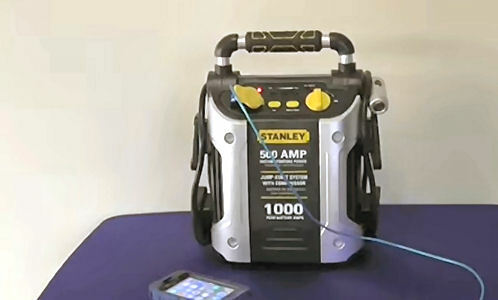 All Stanley jump starters manufactured by Baccus Global have an off on switch to allow the connection to be made with the unit switched OFF. This is a safety feature and helps prevent incorrect connections and sparks or arching. Once connected switch the unit on to achieve output to the clamps. Charge your phones on the move and never be stranded out of contact again with the J5C09 built in charging point. Jump starting a vehicle can be a tricky operation, there are safety concerns, options such as battery chargers, jump starters, push starting etc (see wiki page). This is where this particular jump starter excels, because it makes all of these concerns disappear by making the process of jump starting many different types of vehicle a simple, safe and hassle free 2 minute job. Considering the power, and the useful additional functions, it is no wonder that the Stanley J5C09 has been the motoring world’s number one best seller for years. Buy in confidence, highly recommended! Very comforting knowing if I have problems while out on the lake starting the engine, I have the jump starter with me. Would highly recommend. A product everyone must have. .. Tested the air compressor and on my SUV with a tire a little low on air. Worked quite well. The USB Port works just fine with my cell phone and android smartphone. I started a battery in a matter of seconds. I inflated two vehicles (8 tires) to the tire manufactures specifications. I am so in love with this unit and you will just never know when you need it! The unit isn’t too bad to carry, especially for the purpose and the time your really depend on this device. As the saying goes, more power the better. My unit lasted about 10 years. That’s about $6 of ownership per year for not being stranded. The light, USB charger for the phone, tablet and GPS were awesome. The product only fell short with the air compressor. Just under a year, it started to overheat and wouldn’t reach 30psi inflating a tire until it just stopped pumping, but then made a wild noise. I opened it up and the rotational pin had broken. I placed in another pin I had of better material. It lasted another year. I’ve just gotten another one of these, but without the compressor. It’s had to beat this brand name product. The clamps are sturdy and strong, the cable length is just right and the wire gauge is durable.